This set of two 29 inch high barstools in a white finish is the perfect addition for kitchens, game room or for extra seating when company arrives. With a comfortable saddle seat and well positioned footrest, these classic bar height stools will be the staple of many memorable evenings with friends and family. Barstool - 2Pcs / 29 Inch H / White Saddle Seat This set of two 29 inch high barstools in a white finish is the perfect addition for kitchens, game room or for extra seating when company arrives. With a comfortable saddle seat and well positioned footrest, these classic bar height stools will be the staple of many memorable evenings with friends and family. Barstool - 2Pcs / 29 Inch H / White Saddle Seat is rated 2.0 out of 5 by 1. Rated 2 out of 5 by Kage from Expected higher quality The stools work for what I need (narrow enough for my space, white and the right height) however at $50/stool I wasn't expecting gloppy paint drips, scratches and large, deep dents in the wood. If I hadn't put them together I would suspect that they had been previously used (and abused). If you can find another stool that meets your specifications, don't buy these. 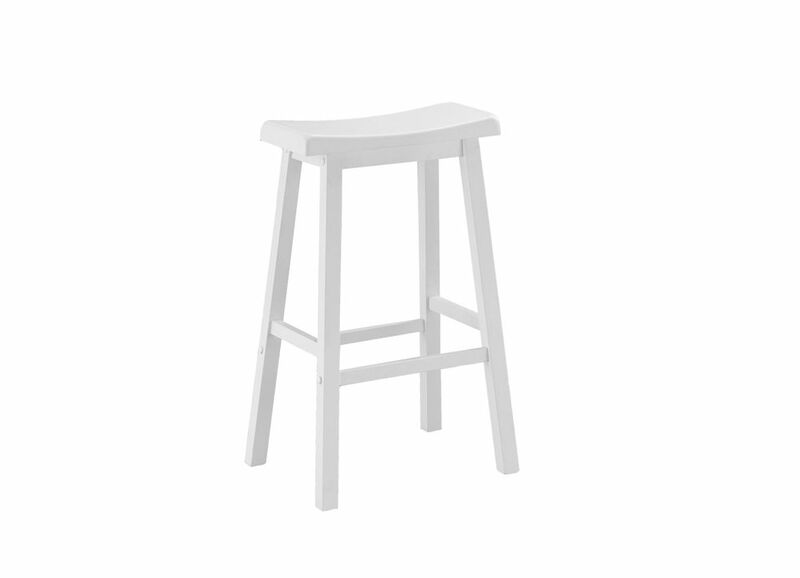 Hello, yes these stools to come in 24 in H. You can view/order them here (item : 1000843326) https://www.homedepot.ca/en/home/p.solid-wood-white-contemporary-backless-armless-bar-stool-with-white-solid-wood-seat---set-of-2.1000843326.html. We hope that helps. Thank you.